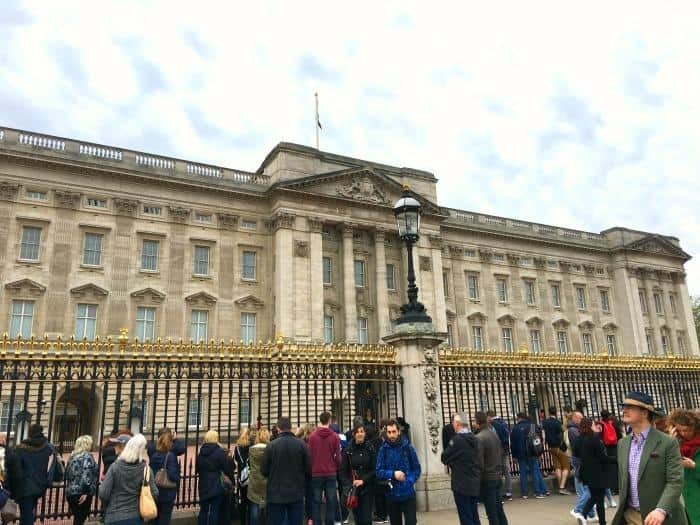 Going to Buckingham Palace is probably on every travel itinerary for tourists who are visiting London, especially for the first time. The Royal Mews is just next door but is probably a less visited attraction, which I think is a real shame. During our family weekend at Hilton London Canary Wharf I really wanted to show the girls, aged 5 and 3 years old, where the Queen lived. Buckingham Palace London is an incredibly British institution, and I wanted to introduce Indie and Brook to one of the most iconic symbols of our interesting and sometimes colourful heritage. A visit to the Royal Mews London was a definitely about a trip down memory lane for me. 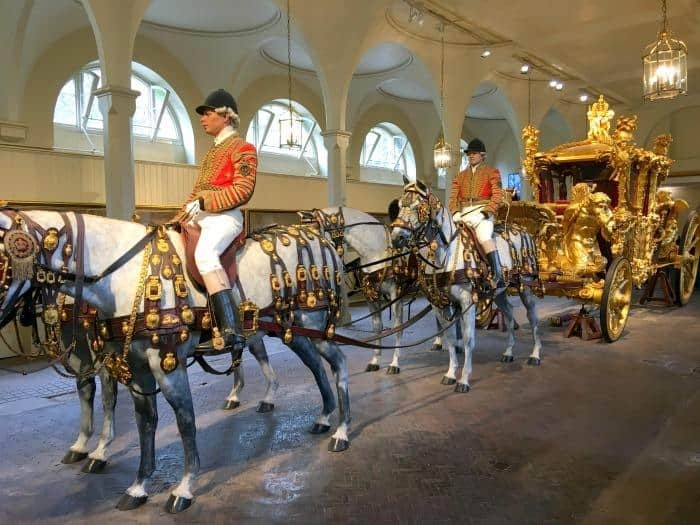 I can remember visiting the Royal Mews when I was a child and being absolutely awestruck when I saw the Golden State Coach and the other Royal carriages in this working stables. The best way to get to Buckingham Palace is definitely by tube, as it’s literally surrounded by stations. If you are keen to walk down The Mall, then Charing Cross via the Bakerloo or Northern Line is definitely your first choice. The 15 minute walk will take you past Trafalgar Square and Nelson’s Column. If you prefer a more scenic stroll with kids then head to Green Park via the Jubilee, Victoria or Piccadilly Line. You can walk straight through Green Park in about 10 minutes, and it will be a lot easier to navigate with children. 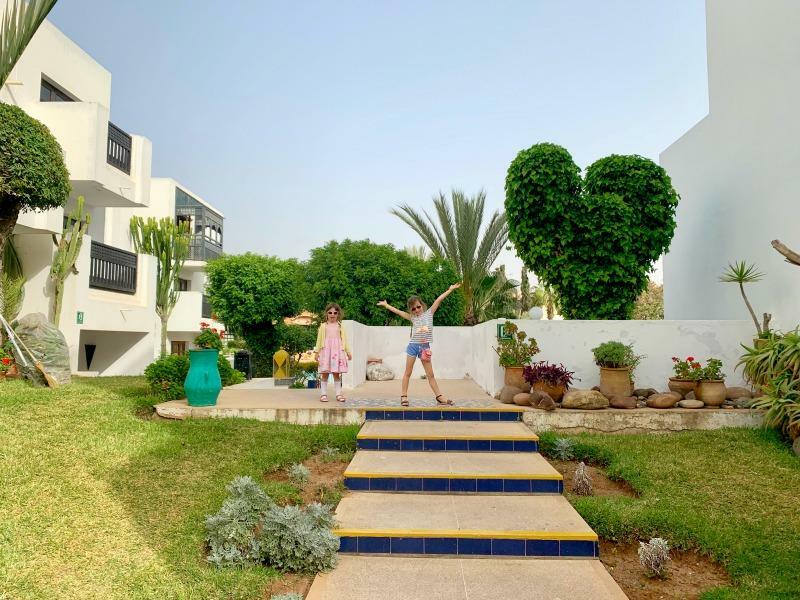 The other options are to go to Westminster, St Jame’s Park, Hyde Park Corner or Victoria stations which may be more accessible depending on where you are travelling from. 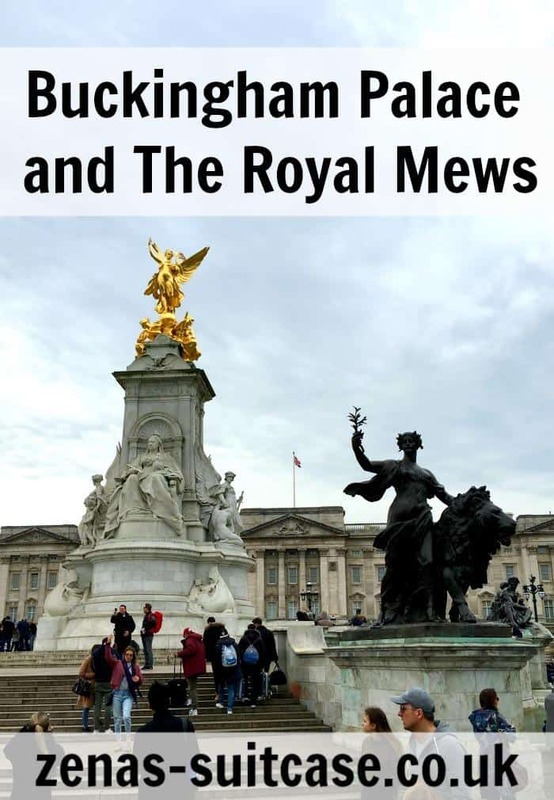 If you have bought the London Pass this includes tube travel or a hop on and off bus tour, both of which will get you to Buckingham Palace and the Royal Mews. Your visit to the Royal Mews is also included as one of the 80 attractions you can visit using the London Pass. When we arrived at Buckingham Palace with the kids, Indie was bubbling with excitement. Her little sister on the other had decided this was an appropriate time to take a nap and missed her date with the Queen. I guess sleep is just more important sometimes. While she grabbed 40 winks in the pushchair, we all took a look around the gates and at the Queen Victoria Memorial. The famous monarch presides over The Mall surrounded by some equally impressive symbolic statues which are well worth a visit. There’s something very exciting about being outside Buckingham Palace. Everyone is hoping they will catch a glimpse of a Royal resident or a little sneak peek into life at the palace. Unfortunately for us, the kids were likely to be hungry before the Queen was going to photo bomb our selfies so we stopped at a cafe between Buckingham Palace and the entrance to the Royal Mews. It served Italian food and classic British dishes like egg and chips. I wish I had made a note of the name as it transpires there are a lot of Italian inspired cafe’s near to Buckingham Palace when you look on Tripadvisor! With all the kids awake and fed we were keen to start our visit to the Royal Mews. Pushchairs are allowed at the Royal Mews and getting around the attraction with one is really easy. We picked up our free family audio tour and headed through to the stables. Indie loves audio tours and when she heard that the horses went to school she couldn’t quite grasp it. She struggled to see how horses might sit at desks all day which led to a enlightening conversation about what a riding school was. I could tell already this was going to be a great audio tour for kids. The first inhabitants of the Royal Mews that we met were a couple of the Royal horses. They are such splendid creatures and the fact that they are completely white makes them seem very majestic, especially when you are a child. We left the horses and went to see some of the carriages that they pull on Royal engagements. The audio tour provides some history to each carriage and there are also some videos of them in action as well. After we had seen the Royal coach collection including the Diamond Jubilee State Coach we went inside to where the Golden State Coach is kept when she is off duty. It really is quite a magnificent carriage, but it’s size and design doesn’t lend itself to a particularly comfortable ride. Because of this the Golden State Coach is only used for very important Royal occasions like weddings and coronations. The Golden State Coach is presented as if it were in use with replica horses and footmen. It is quite stunning to see with all it’s gold gilding and ornate features. It was as impressive as I remember it being when I was a child, and we all enjoyed being able to get so close to this carriage. The carriages wowed the girls a lot, and the Royal Mews visit was just the right length of time for them to enjoy it. We spent about an hour in the Royal Mews and around half an hour at Buckingham Palace before hand. 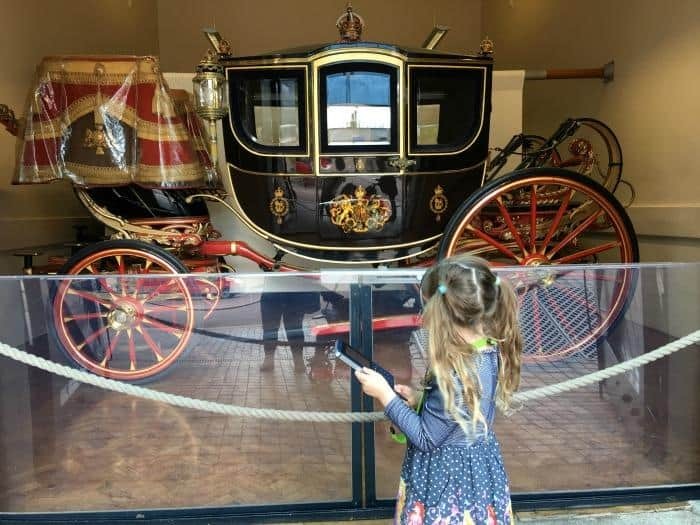 Being from the UK, the main thing I took from our visit to Buckingham Palace and the Royal Mews was that there are some incredibly historic and important aspects to British culture that we should be able to feel proud of. Being reminded of this in the light of some of the things I’m not quite so proud of, i.e. Brexit, was an important part of our visit to London. 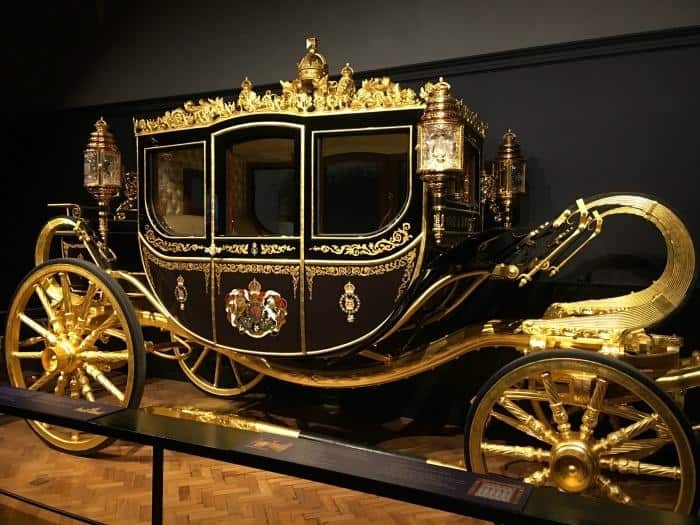 Whether you are visiting the UK from overseas or you live in the UK I would recommend a going to Buckingham Palace including the Royal Mews visit, especially if you enjoy horses, history and all things Royal. 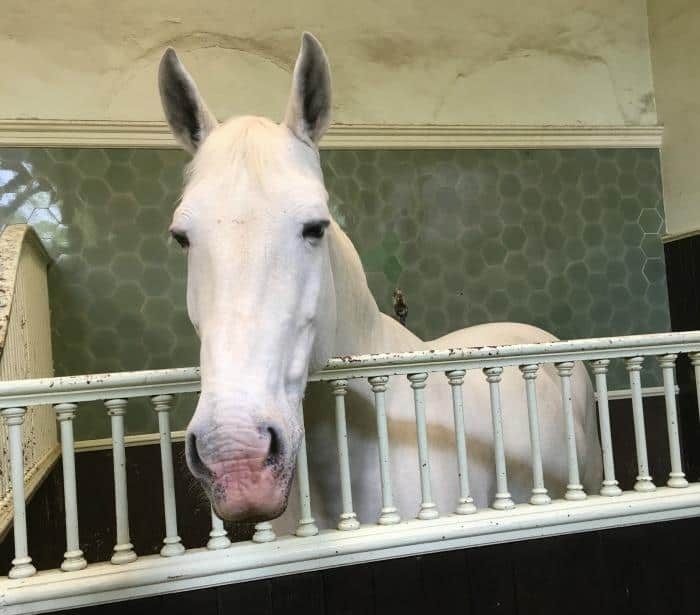 We were invited to the Royal Mews in exchange for this post but all thoughts and opinions are our own. Looks like a great time was had. I’ve not been there since I was at middle school over 20 years ago! I really should go back! What an amazing treat I can’t believe I am born and bred British yet still have never visited! Fantastic to get up close to the horses like that. 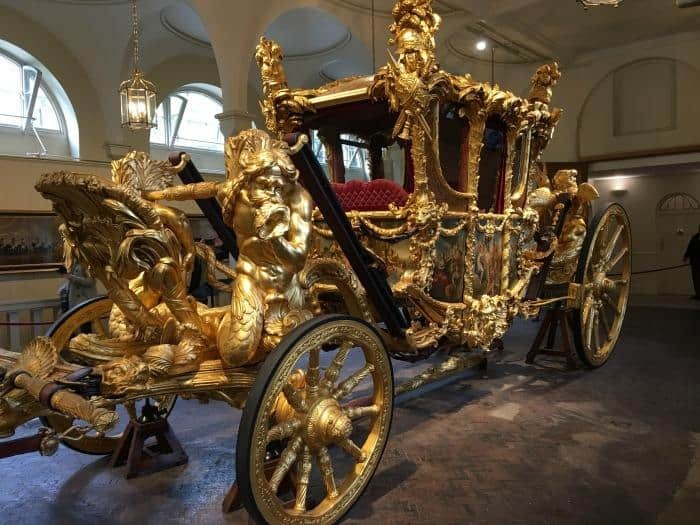 I would definitely like to check out the Royal mews one day, seen Buckingham many times but never seen the palace. Wow what a fab day out! We went to Buckingham Palace last year and Lewis really enjoyed it, but I haven’t even heard of the royal mews! Fantastic day to spend with the family and quite memorable. I visited a couple of times. Musings of a tired mummy…zzz… recently posted…Aldi haul! Clothes! Super pics. Those coaches are spectacular. I need to be a tourist in London. Not been to many of the tourist attractions including this one. WOW I would love to see the carriage, that looks so nice to see it up close. I’ve never been to the Royal Mews. In fact I didn’t even know it existed… I’ll have to plan a visit! I live in London and should certainly do the touristy thing, so much history and true britishi heritage here! This looks so interesting. Would love to visit – it looks enchanting. No visit to London is complete without a trip to Buckingham palace! We don’t live that far outside London & I’ve never been to the Royal Mews.